Do you think passwords, fingerprints, pin lock or question like your pet name…your fav actor and that “facial recognition “thing “can guarantee your security on your devices . Around 90% of businesses will use biometric authentication by 2020 and Fingerprint scanning is currently the most common type of biometric authentication: 57% organizations use it. Far fewer, just 14%, use facial recognition. But question was same do you think they guarantee your security of devices or your personal information. But what we see in future is a something which definitely change the perspective of security where we track and analysis digital behavior of person or employee for its authentication. The best use of this is done many organization but currently leader in this is bio-catch software’s. 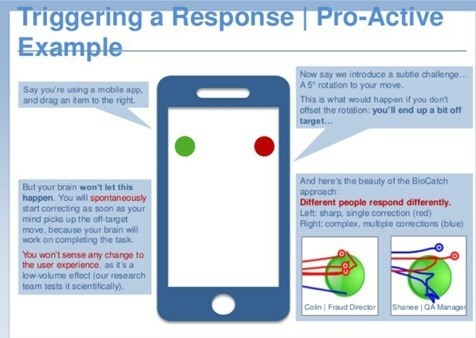 It basically run in background to build a “behavior profile” of a user, and learns activities like how someone holds the phone, whether they type with one or two hands, whether or which area of keyboard they mostly use ,confidence or curiosity in there face and how they scroll or toggle between screens etc. Now Question is what behavioral authentication? In simple words it is a cloud-based behavioral authentication services/application for mobile and web applications. Which provide best ways to keep your system secure. It mainly analyse User interaction, Environment ( Input from environmental sensors on the device, such as GPS, time, and Wi-Fi connectivity),Device movement(check patterns movements etc.). BioCatch uses more than 2000 parameters to create unique user profiles and starts to build a “signature” for you based on how you interact with the site, the device you use, and other identifying information. So in the future, when someone tries to log in to your account, their actions can be compared to your normal usage to help detect fraudulent activity. So this is new way…. which is the future of your Security on information technology world.